A Revolutionary Product that is Easy to Use & Offers Great Value for Money! 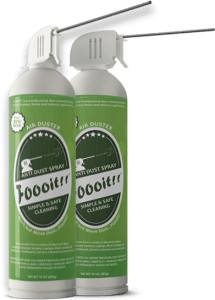 Foooit™ Air Duster is a flammable 10oz bottle that removes dust, dirt and microscopic debris from impenetrable or sensitive-to-touch areas of home and office without leaving any residue. It has no CFCs so is considered as ozone safe.